The Selecto Scientific SMF IC614-2 Cold Beverage Filtration System is one filter that does it all. The first Jumbo sanitary filter on the market, the IC614-2 is ideal for any fountain & multi-use application with up to 1 to 3 carbonators such as coffee, tea, and juice. 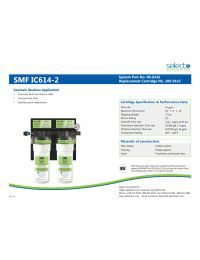 The Selecto SMF IC614-2 is designed for high volume beverage systems to reduce chlorine, chloramines, bad tastes and odors, total organic compounds, tannins and trihalomethanes. Dirt Holding Capabilities. The porous carbon filters have 14 times more dirt holding capacity than conventional carbon filters. Reduces Contaminants. Removes 99% of water contaminants such as chlorine. Reduces chloramines 30 times that of a conventional carbon block. Hollow Carbon Micro-Structure. The structure and treatment of these filters feature ultra high porosity carbon, which provides a consistent dispersion of water flow across the filter resulting in cleaner water and very lower pressure drop. Withstands High Pressure. The nylon construction of the IC614-2 filter has the ability to withstand high pressure. Less Maintenance. Filter replacements are only necessary once a year due to the filter lasting about 10 times longer than other carbon filters. NSF Certified. The SMF IC614-2 is tested and certified against NSF/ANSI 42 & 53 Standards.